1) The time between the end of Test 1 and the start of Test 2 should be 6 to 8 minutes maximum. 2) Tests must be performed on an athletics track or a natural/artificial football field. 3) Athletic spikes may NOT be worn during the tests. 1. The ‘start’ gate should be placed at 0m and the ‘finish’ gate at 40m. The ‘start line’ should be marked out 1.5m before the ‘start’ gate. 2. Referees should line up at the start with their front foot touching the ‘start line’. Once the test leader signals that the electronic timing gates are set, the referee is free to start. 3. Referees should receive a maximum of 60 seconds recovery between each of the 6 X 40m sprints. During their recovery, referees must walk back to the start. 4. If a referee fails one trial out of the six, they should be given a seventh trial immediately after the sixth trial. If they fail two trials out of seven, the match official has failed the test. 1. Referees must complete 40 x 75m run / 25m walk intervals. This equates to 4,000m or 10 laps of a 400m athletics track. The pace is dictated by the audio file and reference times are set in accordance with the referee’s category. 2. Referees must start from a standing position. They must not start before the whistle. To ensure that referees do not start early, assistant test leaders should be positioned at each start line to control the start. 3. 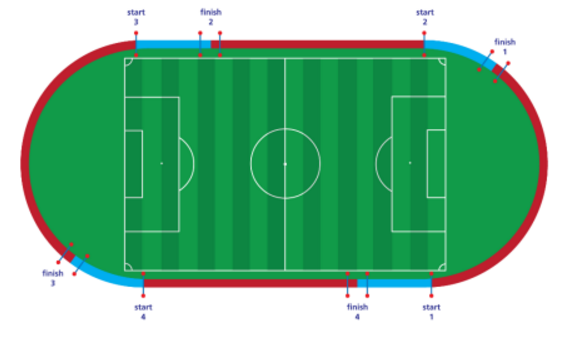 At the end of each run, each referee must enter the ‘walking area’ before the whistle. The walking area is marked out with a line 1.5m before and 1.5m behind the 75m line. 4. If a referee fails to place a foot inside the walking area on time, they should receive a clear warning from the test leader. If a referee fails to place a foot inside the walking area on time for a second occasion, they should be stopped by the test leader and informed that they have failed the test.